Really grateful for our sweet lil' visit @ Canyon Gateway! The property is simple but sweet! Clean bathrooms with awesome hot showers and a free laundromat. The management and staff are so friendly and helpful. It was our second time ever using hook-ups so we were a little confused on how to do it all, but they were so kind and helpful!! Attached is a little path to an awesome gift shop/gas station! The town with great restaurants and the train is a quick little drive with the best window shopping and cool historic route 66! Highly recommend! I am not sure what the point is of letting you pick your campsite online when you book if they aren't going to let you camp in that spot. No where on their page did it say if you have a motorhome you can't have the pull through sites. Those spots are for campers and 5th wheels. I booked an A site and was stuck in a non-A spot when I arrived. Was informed I would have to pay for two spots or unhook my tow vehicle. I will say that the grounds guy was very helpful in trying to find the best spot that would work for our rig. Just be aware that if you book a spot online you will more then likely not be getting that spot upon arrival. They do have a pet area. Their laundry room was broken which was another reason I booked this location. I understand that happens and it was out of their control. They did try to accommodate but I am not sure why I could book what I wanted online but upon arrival I was not given the requested spot. Restrooms were not fancy, but had a very good setup for a handicapped shower. The floors were very flat, no steps or large door sills to imped someone using a walker or a cane. The outside door had a lever style door handle, the inside door did have a round type door knob. I have been in a number of restrooms and showers, these were the most accessible I have used. The campground itself was fine, not exceptional but nice. Our space was fairly level. 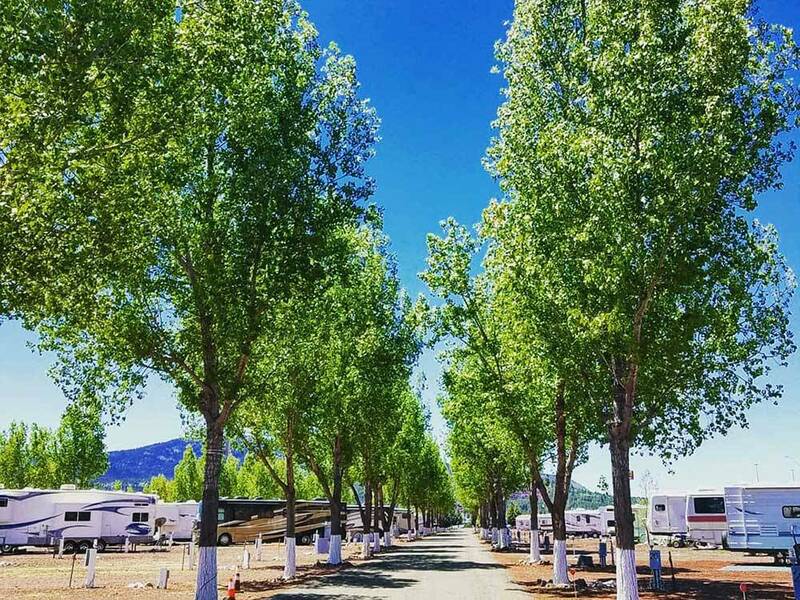 This is a trailer park that is disguised as a rv park. LONG LONG time residents. It appears to be if you break down in your RV this is the place to call home forever. I would not recommend FAMILY camping here. We stayed here one night on our way to the Grand Canyon, and it was good, except for the noise from the truck stop. No problems with hook-up and it was pretty level. I was very impressed with the cleanliness of the restrooms and showers, and I was able to get a wifi connection using their wifi code. Laundry room left a little to be desired. Out of 5 washers, 4 were out of order and 3 dryers were out of order. Park is ok for an overnight stay. Parking a big rig was kind of odd but worked. We were excited to be in the Williams area for the first time and we are fairly new to RV'ing so we have a LOT to learn. Having said that, one of the things we learned in a hurry is to ask to see the RV Park and the rental space BEFORE paying for anything! We paid and then drove in to our spot which was right next to someone who obviously lived there perhaps year-round who had some cheap wire fencing around their trailer and two dogs living under it. Several of these scenarios in this place. After we realized our mistake, I went to the office and said this wasn't going to work for us and could they charge us for one night and refund the rest. Nope. Even though there was NO information stating no refunds posted or on anything I signed, they just kept the money anyway. Much nicer RV parks around than this one. This is not a park for traveling RV'rs, it is a camp for low income permanent dwellers. All types of old trailers and RV's. . Most surrounded with fences, trash, misc junk. old vehicles. Owner is obviously not interested in attracting the average traveling RV'r. No effort is made to clean up or police the park. Many better parks in Williams. This park is just a gravel pit with trees. The appearance of the park is truly frightening due to the filthy areas around the long term residents. The front end of the park is not nearly as bad as the back end. We were placed at the back end and I was honestly concerned for our safety and our property. We pre-paid for 2 nights and upon our arrival we wanted to immediately make our departure. Refunds are not allowed so we stayed and only ventured out for our Grand Canyon tour. This facility really needs to place restrictions on the long term residents as they literally have extreme amount of junk around their trailers . Spare tires , chain link fencing and numrous cars per site are common at this "park". The rate per day at this park does not warrant more than $12 per night as it really is a dump. Save your money, keep driving or spend the night at the truck stop across the street. Pulling 33 ft 5th wheel. We were put in a site and required to pull up within one foot of a trailer in the same line. We asked to move back so that we could unhook our truck for travel. There was no place to park it unhooked. We either had to ask the trailer in front to move or back out of the site with those beautiful trees all around us. No table and no space to sit outside by RV and cook. I've never run into this procedure before. Very inconvenient. We were not pleased. My family and I have been traveling over the last month and we have been impressed with the cleanliness of the facilities and the friendliness of the staff. We loved the views and would definitely come back when we travel through AZ. We highly recommend this for everyone! Since the Love's truck stop has moved in up the hill this park is very noisy. We were in the back sites right near the road going up to the truck fueling lanes. Other sites near the front would be good. Also the site we had been given was right next to a site that they were letting people use as a dump station. Perhaps it was because we only wanted the one day and then were leaving the next morning. The park itself was ok. We didn't utilize the restroom or showers. We only had wifi soradically and then for only a short period of time. We were told "we'll have him reset it. We have trouble up there (presumably on our end of the campground). Also, we were in space 10 and the electrical connection was worrisome. If you even bumped the door to the connection, the electric would shut off. We did not notice noise or lights from the truck stop as others have mentioned. People there were friendly enough. I was happy with the location--right near the highway but not a lot of noise at the site. It was just a few minutes to town and about an hour to the Grand Canyon. Other campgrounds in Williams have to deal with the train noise and crowds. Site was level, but we were on the side with no trees. I would stay here again but would ask for a different site. We stayed in a 32" TT.